Broken Bootlegs is a series covering unlicensed games (also known as bootleg games) for mainly 8-bit and 16-bit consoles. This week’s edition covers one of the more difficult Russian-made Mario games for the Mega Drive- Mario 4: A Space Odyssey (Космическая Одиссея). After having previously covered a Super Mario World deport for the Famicom, I found somewhat interesting gem that was made for Russian Mega Drive systems. 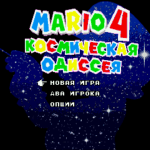 Космическая Одиссея (Kosmicheskaya Odisseya), translated to Mario 4: A Space Odyssey, feels like more of a game that would have been released by one of those awful licensed 8-bit computer system games. Mario 4 is a quite challenge to play due classic issues of bad game physics and awful level design that plague many a bootleg game. Mario 4 starts off with an intro detailing of Mario and Luigi looking at the starts until an alien army comes to destroy the Mushroom Kingdom. 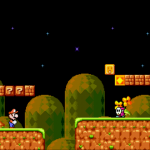 After starting the game up, I was greeted with a generic level design that I would expect from any bootleg. As I tried to figure out the game’s controls, I quickly died due to the timing of bad jump. Upon falling into the pit, I then had the nice surprise of hearing Mario scream. While the scream is a nice design choice, I heard it far too often while trying to play though the game. With frustrating level design, running into enemies or falling down pits was quite a common occurrence. As mentioned previously, the controls are bad at best. Running is being mostly broken, and landing jumps is difficult. Adding to game difficulty though, is the fact that Mario dies in one hit. Graphically, the game is all over the place with a varying number of Super Mario games being sourced. Most of the game’s graphics meshes in decently well, but there are times that it doesn’t look that good. Mario 4 takes a little while to get though, and with the sparse amount of Super Mushrooms and Fire Flowers, those two power-ups don’t help out terribly much. 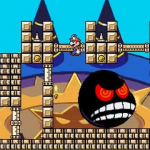 While the Fire Flower can take out enemies, it’s just a straight-traveling fireball, unlike the bouncing fireball found in other Super Mario games. While level progression is somewhat seamless, there’s only one boss battle against a gigantic Fawful head. After defeating the boss, the ending plays. It just looks so angry! After the ending is done playing, that’s all there is to Mario 4. It had the potential for being a fun game, but due to bad game physics, and shoddy level design, it’s really frustrating to play. One of the few bright spots to this game is the music. While the music is taken from various sources, it’s been done very well! A partial soundtrack is up on Soundcloud if ya wanna give it a listen. Mario 4: A Space Odyssey was a bit interesting to play though, even if it was quite frustrating. The best part of the game though, was the music! Sadly, it’s not enough to save the game. For any Super Mario fan, or anyone who collects Russian bootleg Mega Drive games, this would be a good addition to any collection. That said, I really don’t recommend buying this game, especially since the music is up on Soundcloud.